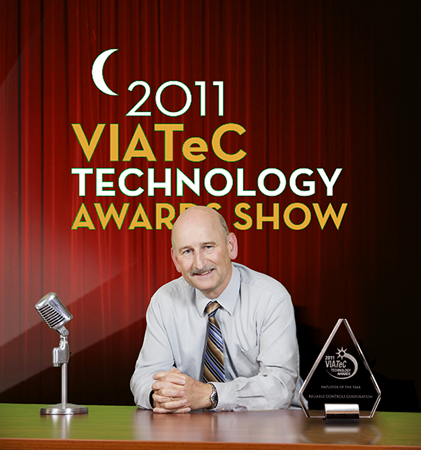 Over 500 Tectorians recently gathered at the VIATeC Technology Awards to applaud the technology community's success for making Greater Victoria a leader in advanced technology in Canada. With a late night TV talk show theme, complete with props and sidekicks, the night was filled with entertaining commentary, videos, and live music. For Reliable Controls it was a banner night, winning the "Employer of the Year" category. Roland Laird was on hand to collect the hardware and thank the extended Reliable Controls family for making our company a winning success. Reliable Controls was also the recipient of the Camosun College School of Trades and Technology "Co-op Employer of the Year" award given to the company that shines above all others in co-op work term feedback. James Puritch and Laszlo Orban were on hand to receive the award. To view the awards, visit www.reliablecontrols.com/corporate/awards.